BJ is a rugged black guy who recently joined the family. Short for Beast Junior, BJ is Brian’s 1987 Jeep Wrangler, bought from a friend in California who has upgraded to a Jeep Rubicon. BJ is junior to an ancient, rustified, mastodon of a pick-up truck Brian used to own. My first out-of-town adventure in BJ took place the last weekend in September on a lovely autumn day. We were getting a late start after a leisurely Sunday brunch. 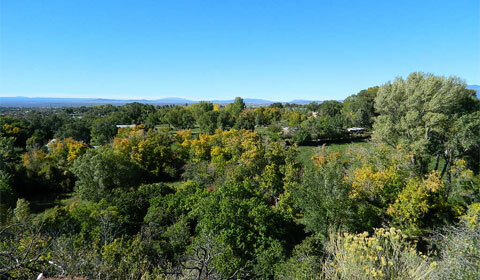 Fortunately, by heading for the back of town from our driveway here in Taos, and then up through Taos Canyon, we can quickly access dirt roads in the Sangre de Cristo Mountains, the southernmost subrange of the Rocky Mountains. On the highway, BJ does fine with his regular 5-speed transmission, albeit not the fastest guy on the road. 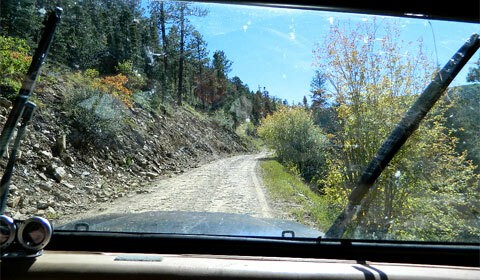 We turned off at Valle Escondido onto Forest Service Road 437 and, once we hit the dirt, BJ’s 33-inch mud tires kept us firmly on the road without needing four-wheel drive. I admired BJ’s ability to take me to the high mountain scenery—without realizing his true capabilities until later in the day. Before we went on even this mellow Sunday drive into the mountains, Brian made sure he was prepared. 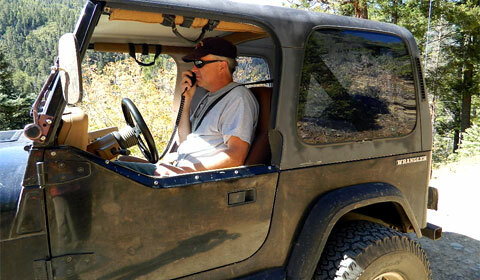 He installed a ham radio into the console of the Jeep in case of emergency. There are no cell towers where we were going and Brian says he would never go into the wilderness without a radio. Brian has been a ham since 1983. He has used it for search and rescue and other emergency services, and to talk to other hams around the world. 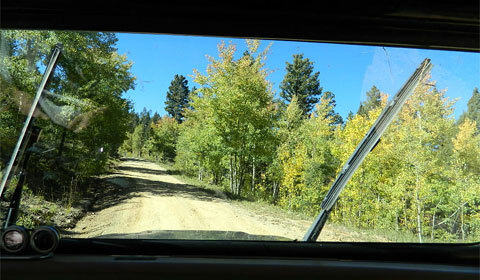 This particular forest service road was very safe and we encountered more scenery than danger. 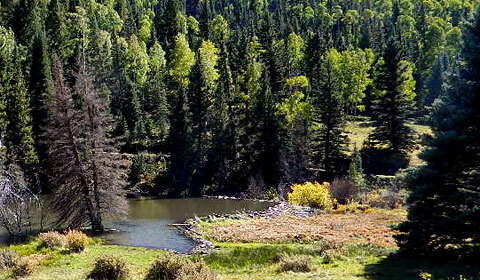 After a pleasant drive past beaver ponds and a lone fisherman, we followed the Rio Chiquito down out of the forest and into Talpa, a neighborhood of Taos. It was only mid-afternoon and we were reluctant to go home, so Brian pointed BJ down Hwy 518 in search of a little more off-road adventure. After some miles of being whipped by the wind, we turned off onto another Forest Service Road (I think it was 476). 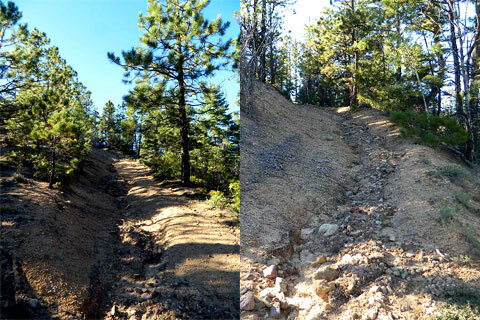 At first, 476 seemed to offer more challenge in the way of erosion and rutted roads, fallen branches and climbing altitude, but nothing dramatic. The scenic delights kept me preoccupied with my camera. 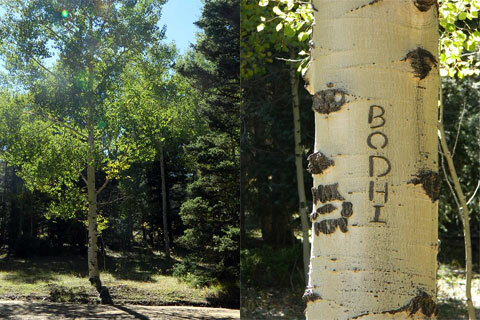 The Bodhi tree. Graffiti at 10,000 feet. Brian kept climbing until we found an intriguing section of 476 at 9,100 feet. Having gained trust in BJ’s rugged tires and high clearance when tackling obstacles, I was eager to see his capabilities put to the test. This seemed like the perfect stretch of road: steep and heavily eroded by the weather. Brian commented that not many vehicles besides ATVs would attempt it. I stopped taking photos at this point because it was wiser just to hang on. We crawled upward in low-range four-wheel drive to a certain point (where even Brian was a little freaked at how steep it was) and then turned around on a high and narrow spot. I was nervous about getting hung up on a tree stump next to the track but BJ didn’t miss a beat. Brian was more worried about our descent. Pointing steeply downward, we slid through the gravel, unable to retain full control because of how steep it was. We regained traction after 60 seconds and carried on as before. A little hair-raising for my first time . . . but it also increased my trust in BJ’s solid temperament. I didn’t start out that Sunday with anything but some scenic wonders in mind. I knew BJ could make that possible so mine was a bit of a utilitarian attitude. 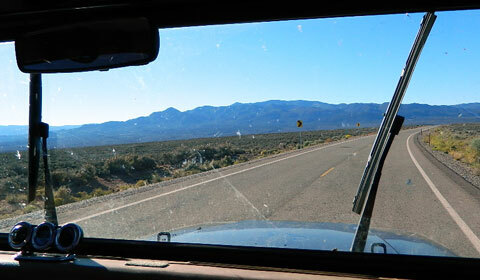 By the time the day was over, I was addicted to the fun of the Jeep Wrangler experience, and in love with BJ. 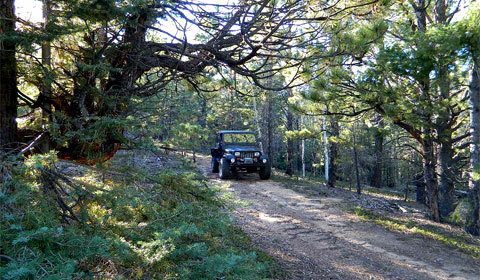 Next episode of BJ: Mogote Peak with ATV friends during fall foliage, coming soon. 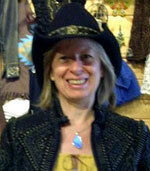 Milli Thornton (aka Milliver) is the author of Fear of Writing: for writers & closet writers. 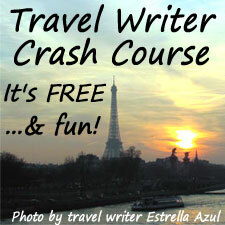 She is owner of the Fear of Writing Online Course and Unleash Your Writing, where her mission is to put the fun back into writing. 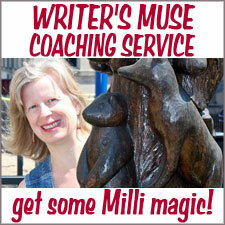 Milli blogs at Screenwriting in the Boonies and coaches writers individually at Writer’s Muse Coaching Service. Oh, Milli, this sounds like so much fun! And the photos are amazing! I would feel totally comfortable doing the back roads with Brian and BJ. What a wonderful adventure! Do it again, Milli! I wanna come too! I’ve never been offroading. All my adventures were on horseback, but this really sounds like fun. Great photos. 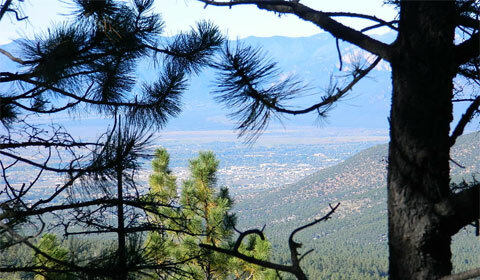 Taos is now on my list of places to see. Way to go, BJ. Wow, Milli, what a fun, well-written wild ride! You’re braver than I; I definitely would have been ‘white-knuckling’ it all the way. Your description of heading downhill in BJ brought back memories of our trip to Costa Rica when we hit mud on a dirt road and slid in a tour bus for what seemed like forever. As we got closer and closer to the edge of the road, my fear became as elevated as our location. You are one brave soul, Milli. 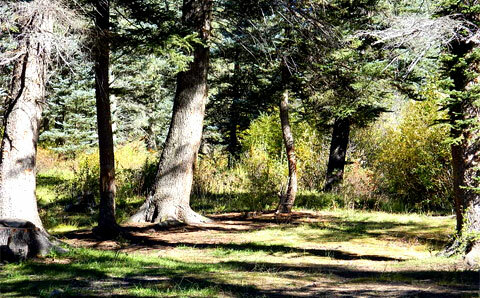 I can’t wait to see some pictures of the fall foliage you’ll be sharing. We don’t get too much of that out here. One day the leaves are green, and then they’re dead. Sigh. Okay, Milli, I am TOTALLY jealous!! What an adventure you had! The scenery is absolutely beautiful. It seems that BJ is a wonderful new addition to your family. I can’t wait to see what other fun outings you all take together in the future. 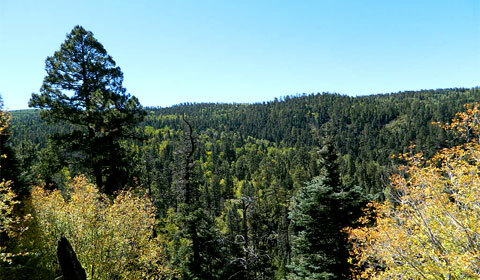 New Mexico is certainly on my “must visit” list after reading your lovely post. Thanks so much for sharing and inspiring! Milli – you know I can appreciate this post for SO many reasons… the desert vistas, the Jeeping… It sounds as though NM is suiting you so well. I know you missed the southwest when you moved to Ohio; so happy you’re back! Eeks – that washed out road looked a bit harrowing. BEAUTIFUL views, though. And it looks like hubby is in heaven!